Climate Control: In many cases, pharmaceuticals are just as susceptible to temperature and outside conditions as other perishables like food. Wherever your pharmaceuticals are stored, make sure the temperature is kept at a place that will keep your products fresh – this may vary from medicine to medicine, but the ideal range could be anywhere between 50-80℉. Keep Products Separated: Even if everything is kept in their own containers (bottles, dispensers, etc), you’ll still want to take steps to prevent cross-contamination by giving everything enough space. 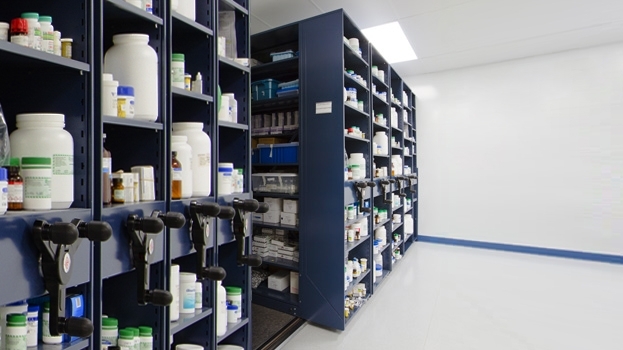 If you’re using wire shelving or medical storage shelving, you’ll want to devote an individual shelf to each different medicine type to prevent any accidental mixing of unlike pharmaceutical products. Plastic storage bins can be a good solution for this as well, if the products are small enough. Secure Access: Even above and beyond your usual secure storage methods, pharmaceuticals are required by federal law to be protected by further security methods for both the individual products and the facility as a whole. The area where the products are stored needs to be locked away using a keycard or entry code, and each of the products should be kept on security shelving with a lock to prevent unauthorized access to the medicines themselves. Proper Labeling & Protection: Everything you store needs to be kept in their own containers (as mentioned previously), but a best practice to keep in mind is to keep everything labeled, easily identified, and up in a safe area. Try to keep the storage areas well-lit and free of obstruction, and make sure your workers are trained on handling practices, product identification, and how to properly enter the secured areas these are stored in. Thank you for this informative article. It was very helpful, looking forward to new blogs.